Both Dan Steers and Dan James are all too familiar with the Road to the Horse phenomenon. Steers’ business partner James competed at Road to the Horse 2012 and 2013. James, as one half of the Australian team, took the World Championship title in 2012 by storm. Both years, Steers assisted James outside the round pen as Pen Wrangler. 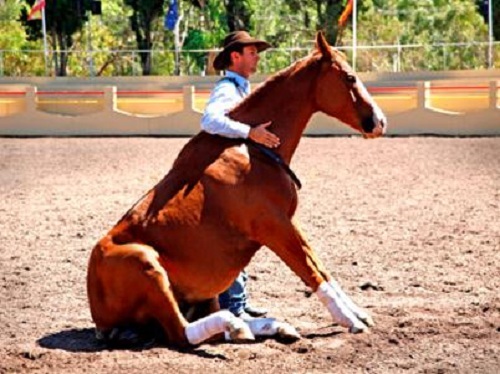 As the other half of Double Dan Horsemanship, Steers entertained crowds with his light-hearted humour and demonstrated his amazing talent performing in horsemanship demonstrations alongside James. Now, Steers leaves behind his position as wrangler to step into the Road to the Horse spotlight as a competitor. Steers received the personal invitation from Road to the Horse Owner and Producer Tootie Bland. At the time of the call, Steers was competing at the Australian Stock Horse National Show in Tamworth, New South Wales with Double Image, an Australian Stock Horse stallion. Double Dan Horsemanship amazes crowds everywhere with their exciting and individual brand of entertainment, clinics and training. Dan James and Dan Steers, the two men behind Double Dan Horsemanship, are two very talented individuals .